A one hour television film about the transvestite teenagers of Thailand, their extraordinary journeys across Thailand and the cabaret life they find at the end of their stardust trail. This film, and excerpts, can be licensed for television from Harcourt Films Ltd.
Made for Channel 4 in the UK, it was shown by them three times in one year and attracted a record number of viewers to its Saturday night screening. It has been shown on selected television stations around the world, in film festivals, winning major awards and opening the San Francisco Documentary Festival. Ladyboys offers an intimate portrait of teenage boys who leave their impoverished homes in northern Thailand to find fame and fortune as transvestite performers in the glamorous cabarets of the south.The film focuses on two boys out of thousands who, each year, enter transvestite beauty contests and display themselves in extravagant costumes. We witness the pressures on parents and children to ‘make big money’, and the pain, prejudice and humour that accompanies their transformation into women. The boys audition at million-dollar cabarets in Pattaya, where sets range from Egyptian tombs to Chinese harems. Here the boys develop lasting relationships with some of Asia’s most outrageous cabaret queens, whose intimate friendships offer them a love and security the outside world denies them. We follow the two boys as their roads divide and each discovers that success and failure and two sides of the same coin. Chasing Rainbows is an eight hour series featuring British music in its many glorious and unexpected forms across the whole of Britain. It includes working men’s clubs, Northern soul, heavy metal, head-bangers, musical comedians of several generations (from music hall to TV), rock groups, pub bands, folk musicians from the hills and valleys, jazz, soul, blues .. and many, many others. This series was shown on Sunday nights on Channel 4. Excerpts and clips can be licensed through Harcourt Films Ltd. Shown on BBC Arena, and co-produced with the Arts Council of Great Britain. The Grateful And The Dead tells how that infamous West Coast rock band came to support, secretly, some of Britain’s most neglected classical composers. 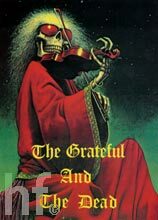 An unusual story of musical contrasts and compassion, featuring interviews and live performance from the Grateful Dead, and orchestral and symphonic performances of the classics masterpieces part-funded by The Dead. This film, and excerpts from it, can be licensed through Harcourt Films Ltd.